I am an Electrical Engineer with a PhD from University of Michigan, Ann Arbor with an excellent academic record (4.0 GPA in undergrad and grad school). I love math, physics and programming. I have taught undergrad courses in discrete math and graduate level courses in probability and statistics. I am a patient and understanding tutor with a strong grasp of the fundamentals that allows me to adjust my teaching level and explanations to the ability of the students. Success breeds success, the saying goes, so it is important to gain confidence in order to understand and love Math. I would love to help you gain this confidence and attain a love for these subjects as I have. Rate details: For AP classes and college level courses, the charge is $60 per hour. I am an Electrical Engineer with a Ph.D. in Communications and Signal Processing. Apart from being trained in C & C++, I use both of these languages in my daily work, which involves computer simulations of complex cellular networks. Therefore, I consider myself an expert in C & C++. I am an Electrical Engineer with a Ph.D. in Communications and Signal Processing. I also have taught myself Python and have used it to create a GUI for processing of large amounts of data. Thus, I consider myself proficient in computer programming concepts like data structures and algorithms. I am a self-taught lover of Python. I use Python to process large sets of data that I generate from simulations at work and produce meaningful results from these. I have also built a full communication system simulator in Python with extensions in C++ and written a GUI front end for processing large data sets that the Python simulator output across batch simulation runs. I have 3+ years of ACT prep tutoring expertise. I am a Ph.D Electrical Engineer. Ph.D. in Electrical Engineering, have been tutoring Math for the last two years at high school level. I assist in ACT Training classes conducted in Aurora and have experience with ACT Math and ACT English preparation. Over the course of my education (Ph.D. Electrical Engineering) I have done various courses that required knowledge of Linear Algebra. My Ph.D. thesis also involved the use of linear algebra. I consider myself well versed to expert in Linear Algebra. My daughter was having trouble with an AP Physics class. 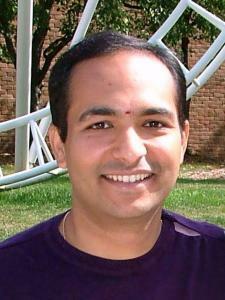 I initiated contact with Arvind through the WyzAnt web site and he called me back right away. During the initial call Arvind assured me that he could break the subject down and explain it in ways that my daughter could understand. His approach is very hands on to the point where he asks what lesson they are currently on so that he can come prepared with a concrete lesson plan geared to attack that lesson. Since Arvid has been on the job, my daughter's struggles have come to an end. Her grades have gone from a high C to A level, but the most noticeable difference is in her confidence which is night and day. We have used tutors before but I assure you that none of them were as thorough and professional as Arvind. I would highly recommend him to anyone in need of a tutor. Arvind is the best math teacher we ever have. He is very good and skillful with the subject. He understands how to help and teach my child in Barrington High school. He was able to help my High schooler with a quick turn around test and did it again a second time. My child feels that she is able to grasp the subject matter after each tutoring where she was struggling and feeling despair before. I thank Arvind for his attentiveness and effort to help my child. He is also able to identify weakness and willing to help work with the child to gain confidence. He is the best ever! Arvind was a great tutor. He helped my daughter on the problems she had questions and needed advice on. Arvind taught Algebra 2 and my daughter was very happy after the lesson. The lesson was what she required and we thank him for the help he offered. Would highly recommend his services. Arvind is working with my son on ACT science prep. My son said that after just one lesson he has already learned several tips that he thinks will help him improve his score. Very effective. Stays on task. My 7th grade child had his first lesson with Arvind on a Python project. He is knowledgeable about the language. He has the ability of breaking down a complex project into logical pieces and teaching the student to tackle them piece by piece. He effectively challenged the student to think and come up with their own solutions. Overall his tutoring is right on the mark and is very result oriented. Arvind is tutoring my son in Physics. My son states Arvind explains in a way that he is able to understand, and is extremely patient, especially when he has questions. Very Knowledgeable Tutor, very patient. Arvind is a wonderful teacher. He explains things in a way my daughter can understand. He's very easy to reach by phone. Engaged him to tutor my son in Calculus. Very sincere tutor. Makes sure that the student understands the subject. Works to your schedule and flexible. I am sure this semester my son will do very well in Calculus due to Arvind tutoring him. Arvind is a very knowledgeable tutor. He was able to help me with my Statistics/ programming assignment very quickly and effectively. We had a tutoring session on the day I asked for help and he solved a complicated machine learning problem that I was struggling with. I would highly recommend working with Arvind! My son is preparing for ACT on his own since last three months. On the very first meeting, Arvind found some key points in which my son is weak. He has trouble for managing time in Math and also spending too much time on questions that should have been answered quickly. Arvind went over ACT Math strategies and how to manage time effectively.